Let’s drastically shorten the runtime of the nZDM option coming with the Software Update Manager (SUM)! Are you up for running a nZDM maintenance activity soon? The Software Update Manager (SUM) comes with a feature named near-Zero Downtime Maintenance (nZDM) technology. With the Record & Replay technique in nZDM, which uses the Change Recording and Replication (CRR) framework, you can capture database changes in tables on the production instance during uptime. 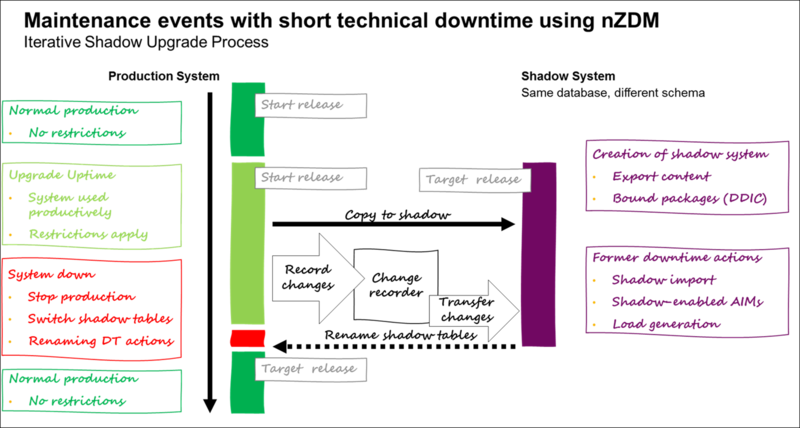 This trigger-based change recording technique allows importing new content into the shadow instance and adjusting table structures to the new release while all users are still able to work in the production system. The recording of data changes is started automatically by the SUM and is transferred to the shadow instance iteratively after the table structure adjustment. You can monitor the progress of data transfer by logging into the shadow instance, once prompted by SUM, and call transaction CRR_CONTROL. In addition you can stop and restart the data transfer. Furthermore, you can add and exclude tables from the data transfer. SAP Kernel 7.42 is not supported. For SAP Kernel 7.45 the required patch level is 725. For SAP Kernel 7.49 the required patch level is 513. A patch for SAP Kernel 7.53 is currently in process. SAP Note 2591334 will be updated accordingly as soon as the patches will have been made available in the SAP Software Download Center.